Formed by the coming together of a number of avant-garde European groups in 1957 and dissolved in 1972, the Situationist International “developed an increasingly incisive and coherent critique of modern society and of its bureaucratic pseudo-opposition, and its new methods of agitation were influential in leading up to the May 1968 revolt in France” (Knabb, “Preface” ix). 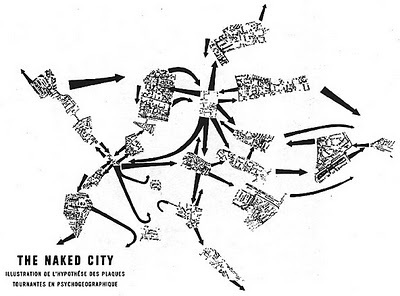 Guy Debord’s work The Society of the Spectacle (1967), which was to become the most recognized written work produced by a member of the SI, explored the city as itself a commodity-form riven through by capitalist ideology in material form. Consisting of 221 numbered entries, ranging from a sentence to a length of several paragraphs and organized under nine chapter-headings, the work seizes upon the Marxist trope of totality to explain the spectacular nature of contemporary urban and social life: “The spectacle is not a collection of images; rather, it is a social relationship between people that is mediated by images” (#4, p. 12); “Understood in its totality, the spectacle is both the outcome and the goal of the dominant mode of production […] it is the very heart of society’s real unreality” (#6, p. 13). Though perhaps revolutionizing Marxism to a certain degree, arguably reformulating a schism between base and superstructure equated with traditional Marxian thought, the focus on the dialectical relationship between thought and action, ideology and material production as well as concepts such as alienation, capital, commodity fetishism, the class character of society, and the triumph of exchange-value serves to reestablish Marxism as an appropriate lens through which to view even those more contemporary qualities of capitalism which Marx himself was perhaps unable to articulate. “dérive (drift): A mode of experimental behavior linked to the conditions of urban society: a technique of transient passage through varied ambiances. Also used to designate a specific period of continuous dériving.” (Guy Debord, “Definitions” 52). See an online text library here. Here’s a 1983 Interview with Henri Lefebvre discussing the Situationists, with whom he shared ideas and had arguments.